The GDPR is the new European regulation on the collection, processing and sharing of personal data of customers. Its goal is to restore “ownership” of personal data to the individual. This new legislation will also impact Orange. The GDPR or General Data Protection Regulation essentially unifies the existing regulations of all 28 member states in terms of privacy and data protection. What is so innovative about the GDPR is that companies are responsible for processing the data and non-compliance can lead to hefty fines. The new legislation goes into immediate effect as of 25 May 2018 and as a result, national governments are not required to pass any enabling national legislation. Jan Leonard emphasises that Orange doesn’t consider GDPR a revolution. “It’s a logical and necessary evolution of the protection of personal data and once again highlights the importance of appropriate protection. At the same time it is also an opportunity for us to further upgrade our level of protection”, he concludes. What does this legislation mean specifically for our customers? Customers will have greater control over their personal data. “The procedures used to answer customer questions will be adjusted. For instance, the right to access your personal data or the right to be forgotten”, Jan Leonard explains. Customers will also be able to transfer their relevant data in a safe and simple way. Moreover, customers will receive more information on the use of personal data and the purposes for processing in case of a so-called opt-in and opt-out. In layman’s terms: customers can manage their own personal data at all times. In layman’s terms: customers will have access to all relevant information on their own personal data. 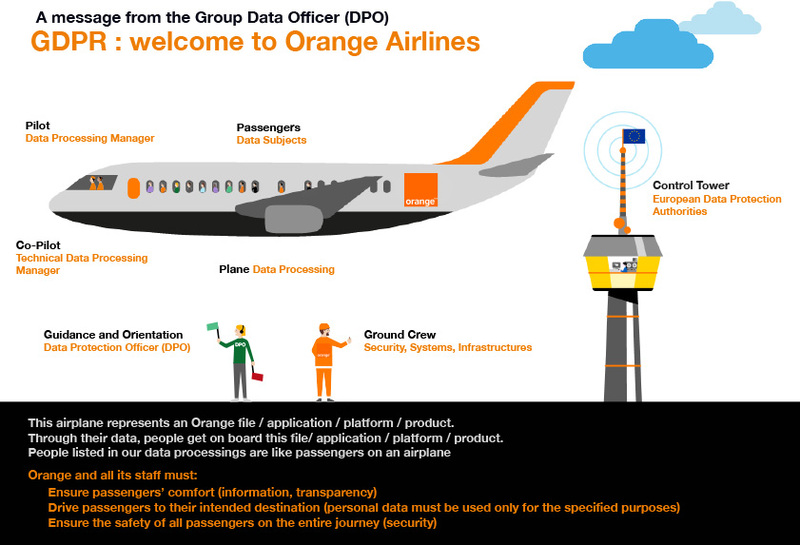 In layman’s terms: Orange is gearing its organisation and operation procedures to conform to the GDPR legislation. In short, Orange is leaving no stone unturned in terms of GDPR legislation. “By late 2016, Orange Belgium had already made the necessary adjustments to its data protection program and changed its name. For instance, the GDPR programme is comprised of 15 initiatives ranging from how to answer customer questions to the data protection impact assessment”, Jan states. The programme was approved and its progress is being monitored by the board of directors of Orange Belgium. In layman’s terms: Breaches of the GDPR legislation must be reported and are subject to a fine. If you have any questions please contact your account manager or go to this page for more details on the consequences of the GDPR for your business.